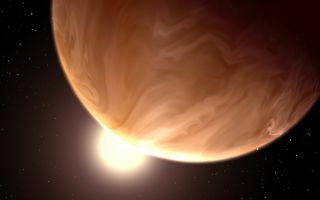 This space wallpaper is an illustration of the hypothetical appearance of the exoplanet GJ 1214b, which is known as a "super-Earth" type planet because it is slightly more than six Earth masses. This space wallpaper is an illustration of the hypothetical appearance of the exoplanet GJ 1214b, which is known as a "super-Earth" type planet because it is slightly more than six Earth masses. Spectroscopic observations with NASA's Hubble Space Telescope provide evidence of high clouds blanketing the planet. These clouds hide any information about the composition and behavior of the world's lower atmosphere and surface. The composition of the clouds is unknown. GJ1214b is located 40 light-years from Earth, in the constellation Ophiuchus.